LP601NY City Series Bongos feature Siam Oak shells and include 6 inches and 7 inches diameter rawhide heads! 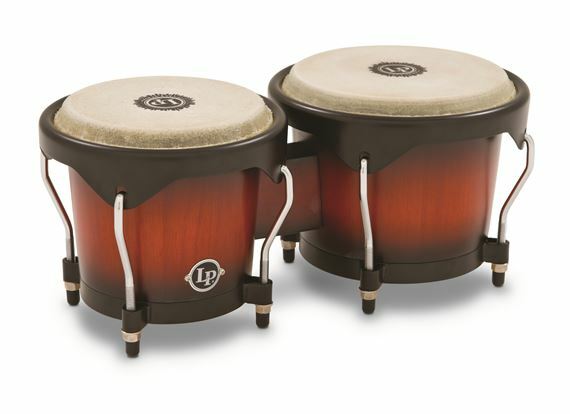 Latin Percussion is proud to introduce the new LP601NY City Wood Bongos. LP City Series Bongos include 6 inches and 7 inches diameter rawhide heads. City Series Bongos are appointed with black powder-coated hardware. I am not a percussionist but I needed a set of bongos for one of my songs. I decided I wanted real bongos and not a VSTI. Anyway I decided on this set. These bongos are heavy and feel well built and solid. I bought a stand to hold them which makes them easy to play. They sound very good and are easy to tune to whatever you want them to sound like. As far as the heads go I guess that's a preference thing so I won't comment on that but the heads on this set sound good to me. For the price I feel you can't go wrong. Perfect match to conga set. Unfortunately the Congo bracket did not fit and had to be sent back because AMS had it pictured wrong on their inventory.